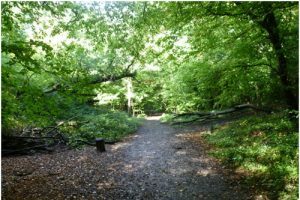 The area of South Norwood comprising the town centre – that is, High Street, Portland Road, South Norwood Hill, Penge Road and Selhurst Road – was once covered by oak woodland: The Great North Wood. Oak trees grew well here because their roots are suited to the heavy clay soil on which the community is built. Although the land belonged to the Archbishops of Canterbury, tenants of the manor had common rights over parts of the wood. The few of them that lived there could graze their animals on the common. Dwellings were rare, the wood being chiefly occupied by charcoal burners, gypsies, itinerant paupers and occasionally footpads. Although the summit of South Norwood Hill remained as a wood, remnants of which survive in Beaulieu Heights, by the close of the 17th century most of the oak trees had gone and the area become known as Croydon Common. This rough grassland on which gorse and blackthorn grew had two tracks crossing it; one running east to west from the hamlet of Penge to Woodside, a branch of it extending towards Selhurst. The other passed from the village of Woodside, northwards up the hill to what is now Upper Norwood. At the end of the 18th century, a number of wealthy residents came together and introduced a Bill to Parliament that would allow them to divide up and enclose the ‘open and common fields, common meadows, marshes, wastes, commonable woods, lands and grounds within the parish of Croydon’. By the beginning of the 19th century hedges had been laid down and a regular pattern of fields appeared. At the same time, a brickworks was established on land now occupied by the Cumberlow Estate and Harris Academy, the clay being of the quality especially desirable for brick manufacture. 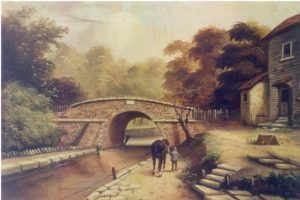 This local industry was enhanced by the development of the London to Croydon Canal, running from the Surrey Canal, a little north of New Cross Gate, to West Croydon, which opened in 1809. Bricks could be transported farther afield from the locality in which they were made. A track ran from the brickworks to a wharf located behind the present shops in High Street – from behind the Ship public house to Portland Road, where barges moored. Other than the sheds of the brickworks and early buildings to take advantage of the enclosed common and the potential custom from bargees, was an inn situated close to the crossroads. This was the first Jolly Sailor, which appears in the Croydon Rate Book for 1810. Besides local trade, the large garden attracted visitors from London who would take a trip to the Jolly Sailor for a pleasant afternoon outing. A difficulty presented itself in that the canal leaked; it was a financial failure. The land was eventually sold to a railway company and a track was laid almost exactly on the bed of the old canal. Opening in 1839 and operated by the London Brighton & South Coast Railway Company, the railway was very successful. The first station, called ‘The Jolly Sailor’, was located immediately north of Portland Road Railway Bridge; above the bank at the present beginning Manor Road on both sides of the railway track. With the coming of the railway the area grew rapidly during the middle of the 19th century. The location of the station was found to be unsuitable for its desired purpose, so it was moved to its present site in the 1850s. 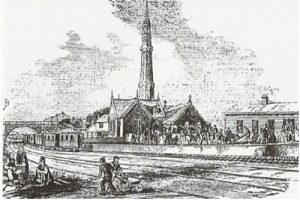 The Jolly Sailor station in 1845, showing the atmospheric railway pumping station, with its Gothic chimney vent. The Croydon Rate Books of around the 1840s record the area as called Lower Norwood. This didn’t suit the well-to-do living in the fine villas going up and surmounting South Norwood Hill. It has also been called East Norwood to distinguish it from West Norwood; at one time the area was referred to as both East and Lower Norwood, but shortly after the middle of the 19th century the name South Norwood appears in the Croydon Rate Books. At this time, Portland Road, from the present High Street to almost as far as Addison Road on one side and just past Doyle Road – first called Farley Road after one of the landowners – on the other, was becoming a ‘high street’. Early South Norwood was established here and the church dedicated to St Mark, a sister to All Saint’s, Upper Norwood, was built, and opened in 1852. The growth of South Norwood is reflected in the several additions to the church, enlarging it as the population, and hence the congregation increased. At the same time, the north-west side of High Street – the side where the present Shelverdine Goathouse public house stands – from South Norwood Hill to Oliver Grove was also being rapidly and successfully developed, largely using locally made bricks. This street was the more fashionable and, once the shops were completed on both sides during the early 1870s, it became the prestigious South Norwood High Street.